One of the ways President Trump wants to crack down on undocumented immigrants is to require all U.S. employers to use E-Verify to check that their workers are legally authorized to work in the U.S.
"We will ensure that E-Verify is used to the fullest extent possible under existing law, and will work with Congress to strengthen and expand its use across the country," President Trump said in a campaign speech in Arizona about immigration last August. Employers who currently use E-Verify submit their employee's personal information online, where it's then checked against databases at the Social Security Administration and U.S. Citizenship and Immigration Services. This allows them to determine whether they are, say, a naturalized citizen or if they might be using a fake or stolen Social Security number. 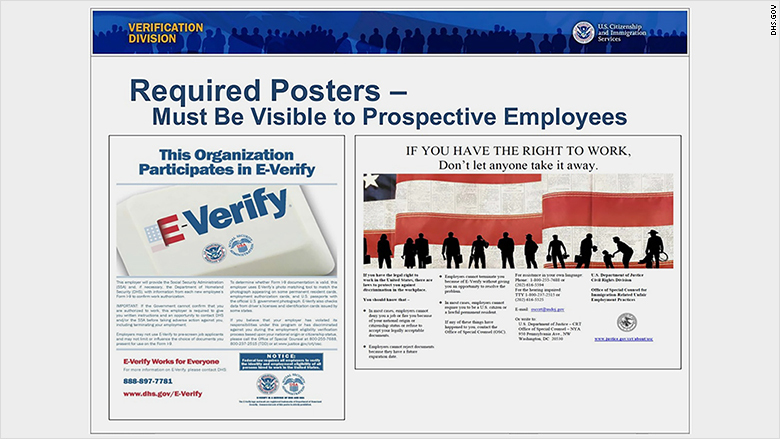 E-verify is a software program created and managed by the Department of Homeland Security. Arizona, long considered ground zero in the fight against undocumented immigration, was the first state to mandate that all employers use E-Verify beginning in 2008. Several other states have started requiring the use of the verification system in some manner since then, including Alabama, Mississippi and South Carolina. Like Trump, Arizona's lawmakers hoped that E-Verify would reduce the number of undocumented workers and open up job opportunities for residents legally authorized to work in the state. But, according to one study from researchers at the Public Policy Institute of California, that wasn't exactly the case. While the number of undocumented workers fell dramatically in the years following the mandate, the number of opportunities that were made available for legal residents didn't materialize at nearly the same rate, said researchers Magnus Lofstrom and Sarah Bohn, who conducted the study for the San Francisco-based think tank. Lofstrum and Bohn examined E-Verify's impact on Arizona's workforce between 2007 and 2009 and found that the state's undocumented population declined by about 92,000 people, or about 17%, as workers left the state to look for jobs. Many of the workers who remained, however, were pushed into so-called "informal employment," working as day laborers or independent contractors in fields like construction, lawn care and janitorial work. The self-employment rate for unauthorized, less-skilled men doubled from 8% to 16% between 2007 and 2009, the researchers found. For employers, it was easier to hire these workers because Arizona does not mandate the use of E-Verify for independent contractors and in many cases they were paid under the table, Lofstrom said. For the workers, however, it likely meant "fewer benefits, lower wages, and potential for worsened working conditions," the researchers wrote. Lofstrum and Bohn also found that the mandatory use of E-Verify did very little to improve employment opportunities for the workers who were authorized to work in the state. In fact, the employment rate for low-skilled working-age men authorized to work in Arizona was estimated to have fallen from about 70% to 66% between 2007 and 2009, according to the researchers' analysis of the U.S. Bureau of Labor Statistics' Current Population Survey. "There just weren't enough legal workers ready, willing and able to take the jobs that unauthorized workers are leaving," Lofstrom told CNNMoney. The researchers pointed out that their analysis coincided with the beginning of the recession. "There is evidence that the recession reduced the inflow of new immigrants to the U.S. and new immigrants to Arizona," the researchers wrote. To account for this, Lofstrom said they compared the labor market in Arizona with states that had similar employment trends before Arizona mandated the use of E-Verify, including California, Maryland and North Carolina. The researchers then examined labor market differences between the states since Arizona mandated the use of E-Verify. The researchers did find one positive result: Low-skilled non-Hispanic men who were working during that period saw their average wages increase by as much as $154 a week, or about 10% to 20%, after the E-Verify mandate was put in place, according to Lofstrom's research. Daniel Scarpinato, a spokesperson for Arizona Governor Doug Ducey, said the governor supports the use of E-Verify for background checks. "Currently, Arizona has a growing economy, and Governor Ducey's focus has been on expanding jobs and opportunity for legal workers in all avenues -- the service sector, technology, manufacturing and start-ups," he said. But Lofstrom warns that making E-Verify mandatory nationwide may not have the same impact that it did in Arizona. After all, many of Arizona's undocumented immigrants were able to easily relocate next door to California, where laws are more lenient. Under a U.S.-wide program, however, some immigrants may be forced to leave the country, but many more would likely remain in the country and join the informal economy, he said. 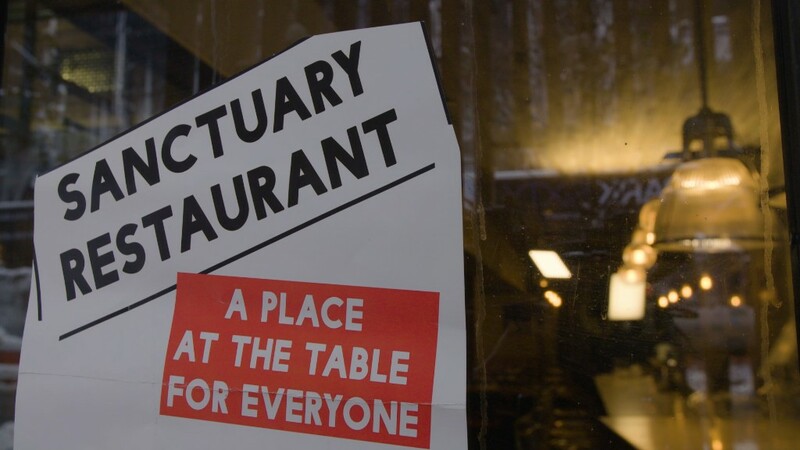 Related: Sanctuary cities - What's at stake? And enforcement on employers would also have to be tougher, he said. One of the challenges Arizona faced is that enforcement of the mandate was often lax. "There aren't any follow ups and there aren't any audits," said Alex Nowrasteh, an immigration policy analyst at the Cato Institute. According to Arizona law, employers who intentionally hire an unauthorized worker could lose their business permit for up to 10 days for a first offense or lose their business altogether on a second offense. But between 2008 and 2013, Arizona prosecutors only pursued this option against three businesses, Nowrasteh said. In all three cases, the employers were accused of knowingly hiring undocumented workers. CATO said the courts levied the minimum punishments allowed against these businesses, shutting them down temporarily. Nowrasteh added that it would likely be difficult to get politicians to support a mandate to use E-Verify nationwide because they wouldn't want to fall on the wrong side of business owners. "In order to enforce it you'll have to shut down thousands of small businesses in the U.S. and politicians, even those that are very against immigration, don't want to pay the political price of doing it," he said. Arizona's attorney general's did not immediately return calls seeking comment. Accuracy is also an issue with E-Verify. Data research firm Westat analyzed accuracy results for several states using the program between September 2007 and June 2008. While Westat found that E-Verify had improved considerably over time, challenges remained, especially with how well the tool can sift out fraudulent information. "Due to its inability to detect identity fraud, E-Verify remains unable to identify approximately half of workers without employment authorization," the Rockville, Maryland-based firm wrote in its report for the Department of Homeland Security. But Glenn Hamer, the president and chief executive of Arizona's chamber of commerce, said that although his group was initially reluctant to use E-Verify, few businesses in the state have complained since it was improved. But he says E-Verify is only part of the solution. "We also need to reform the visa program to help people come here legally and to stay here. And we need border security. We need a top-down approach to fix our immigration system," he said.